Artlink Inc. is now accepting entries for its 18th Annual Juried Exhibition, featuring the works of professional artists residing in Ar izona. The exhibition will be in the Steele Auditorium here at the Heard Museum on Thursday, Sept. 15, 2016, from 6 to 9 p.m. The deadline for submissions is by midnight Wednesday, Aug. 3, 2016. The Heard is hosting the Juried Exhibition for the first time. Click here for the complete call to artists. Click here for a fillable copy of the required official artist online submission form. Again, the deadline for submissions is by midnight Wednesday, Aug. 3, 2016. 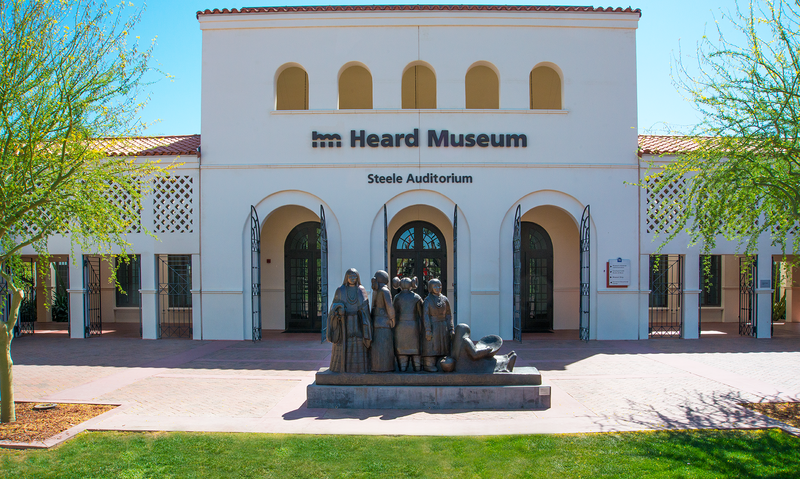 Heard Museum's Steele Auditorium with bronze by Doug Hyde (Ojibwa/Nez Perce/Assiniboin),“Intertribal Greeting.". Gift of Adrienne and Jerry Kay.